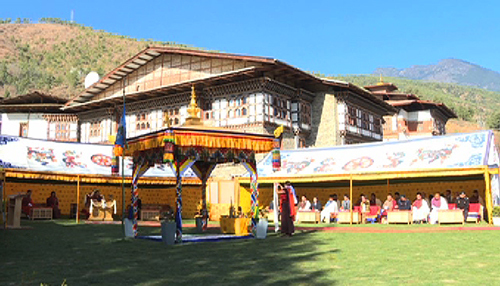 The ground breaking ceremony (Salang Tendrel) for the construction of the first-ever examination facility to test mock specimen of traditional building was held at Kawajangsa, Thimphu, today. Her Majesty the Queen Mother Tshering Yangdon Wangchuck graced the event. The examination facility will be built with strong floors and walls. It will also feature four rammed earth and two stone masonry buildings, states the news release from the Department of Culture under the Home Ministry. Apart from this, the facility will have a shaking table to create artificial seismic action. This is to understand the global behaviour of traditional Bhutanese houses against the seismic action. Officials of the Home Ministry said the government became highly aware of the need to undertake scientific study of the performance of the traditional buildings, and learn how to improve them for better resilience against the natural disasters, particularly the earthquake. “Post 2009 and 2011 earthquake, there was a strong scepticism on structural performance of traditional buildings in the country, which constitute 70 per cent of the building stock in Bhutan,” said the Home Minister, Dawa Gyaltshen. The project is expected to bring positive impact in further s trengthening efforts in preservation and promotion of traditional building practices with improved seismic resilient features. The construction of examination facility to test mock specimen of traditional building is a part of the project called Evaluation and Mitigation of Seismic Risk for Composite Masonry Buildings in Bhutan. This 3.10 million USD project is funded by the royal government and Japan International Cooperation Agency (JICA).